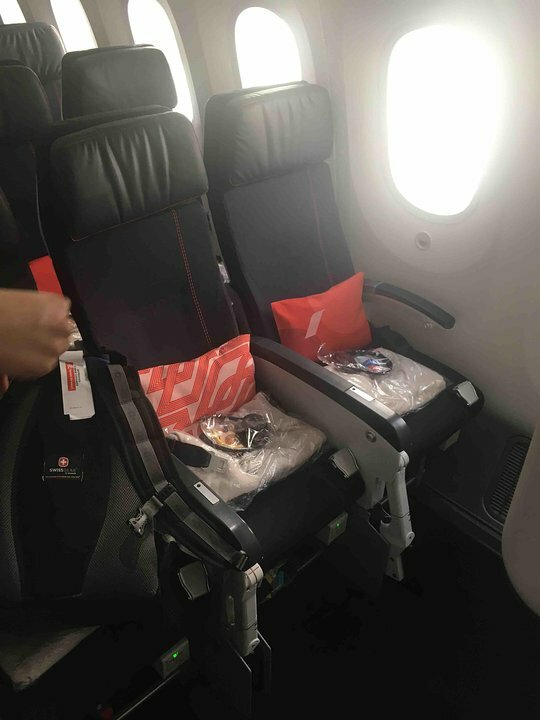 10 A None No Power Seat 10 A is a standard Premium Economy Class seat with extra legroom due to position of the bulkhead, however, the proximity to the lavatory may be bothersome. Passengers requiring a bassinet are often sat here. 10 B None No Power Seat 10 B is a standard Premium Economy Class seat with extra legroom due to position of the bulkhead, however, the proximity to the lavatory may be bothersome. Passengers requiring a bassinet are often sat here. 10 D None No Power Seat 10 D is a standard Premium Economy Class seat with extra legroom due to position of the bulkhead, however, the proximity to the lavatory may be bothersome. Passengers requiring a bassinet are often sat here. 10 E None No Power Seat 10 E is a standard Premium Economy Class seat with extra legroom due to position of the bulkhead, however, the proximity to the lavatory may be bothersome. Passengers requiring a bassinet are often sat here. 10 G None No Power Seat 10 G is a standard Premium Economy Class seat with extra legroom due to position of the bulkhead, however, the proximity to the lavatory may be bothersome. Passengers requiring a bassinet are often sat here. 10 J None No Power Seat 10 J is a standard Premium Economy Class seat with extra legroom due to position of the bulkhead, however, the proximity to the lavatory may be bothersome. Passengers requiring a bassinet are often sat here. 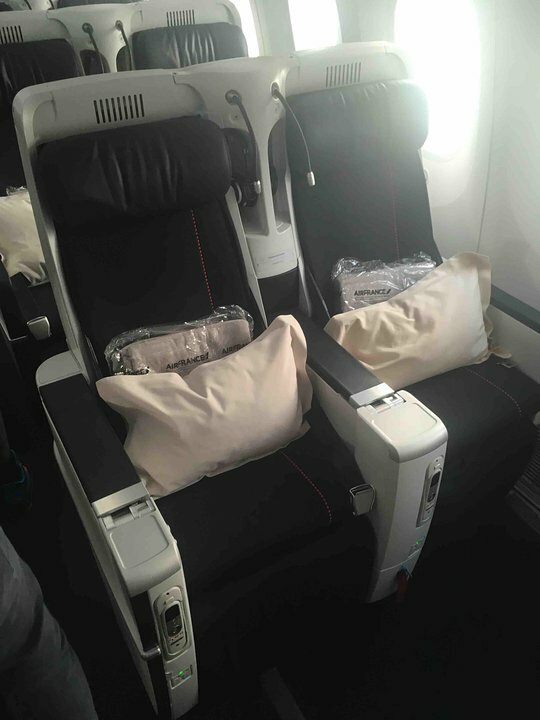 10 K None No Power Seat 10 K is a standard Premium Economy Class seat with extra legroom due to position of the bulkhead, however, the proximity to the lavatory may be bothersome. Passengers requiring a bassinet are often sat here. 15 A None No Power Seat 15 A is a standard Economy Class seat. Passengers requiring a bassinet are often sat here. There is no floor storage for this seat during takeoff and landing. The tray table and inflight entertainment monitor are in the armrest, making the armrest immovable and slightly reducing seat width. 15 B None No Power Seat 15 B is a standard Economy Class seat. Passengers requiring a bassinet are often sat here. There is no floor storage for this seat during takeoff and landing. The tray table and inflight entertainment monitor are in the armrest, making the armrest immovable and slightly reducing seat width. 15 C None No Power Seat 15 C is a standard Economy Class seat. Passengers requiring a bassinet are often sat here. There is no floor storage for this seat during takeoff and landing. The tray table and inflight entertainment monitor are in the armrest, making the armrest immovable and slightly reducing seat width. 15 D None No Power Seat 15 D is a standard Economy Class seat. Passengers requiring a bassinet are often sat here. There is no floor storage for this seat during takeoff and landing. The tray table and inflight entertainment monitor are in the armrest, making the armrest immovable and slightly reducing seat width. 15 E None No Power Seat 15 E is a standard Economy Class seat. Passengers requiring a bassinet are often sat here. There is no floor storage for this seat during takeoff and landing. The tray table and inflight entertainment monitor are in the armrest, making the armrest immovable and slightly reducing seat width. 15 G None No Power Seat 15 G is a standard Economy Class seat. Passengers requiring a bassinet are often sat here. There is no floor storage for this seat during takeoff and landing. The tray table and inflight entertainment monitor are in the armrest, making the armrest immovable and slightly reducing seat width. 15 H None No Power Seat 15 H is a standard Economy Class seat. Passengers requiring a bassinet are often sat here. There is no floor storage for this seat during takeoff and landing. The tray table and inflight entertainment monitor are in the armrest, making the armrest immovable and slightly reducing seat width. 15 J None No Power Seat 15 J is a standard Economy Class seat. Passengers requiring a bassinet are often sat here. There is no floor storage for this seat during takeoff and landing. The tray table and inflight entertainment monitor are in the armrest, making the armrest immovable and slightly reducing seat width. 15 K None No Power Seat 15 K is a standard Economy Class seat. Passengers requiring a bassinet are often sat here. There is no floor storage for this seat during takeoff and landing. The tray table and inflight entertainment monitor are in the armrest, making the armrest immovable and slightly reducing seat width. 24 D None No Power Seat 24 D is a standard Economy Class seat with limited recline. The proximity to the lavatory and galley may be bothersome. 24 E None No Power Seat 24 E is a standard Economy Class seat with limited recline. The proximity to the lavatory and galley may be bothersome. 24 G None No Power Seat 24 G is a standard Economy Class seat with limited recline. The proximity to the lavatory and galley may be bothersome. 25 A None No Power Seat 25 A is a standard Economy Class seat with limited recline. The proximity to the lavatory and galley may be bothersome. 25 B None No Power Seat 25 B is a standard Economy Class seat with limited recline. The proximity to the lavatory and galley may be bothersome. 25 C None No Power Seat 25 C is a standard Economy Class seat with limited recline. The proximity to the lavatory and galley may be bothersome. 25 H None No Power Seat 25 H is a standard Economy Class seat with limited recline. The proximity to the lavatory and galley may be bothersome. 25 J None No Power Seat 25 J is a standard Economy Class seat with limited recline. The proximity to the lavatory and galley may be bothersome. 25 K None No Power Seat 25 K is a standard Economy Class seat with limited recline. The proximity to the lavatory and galley may be bothersome. 30 A None No Power Seat 30 A is a standard Economy Class seat with extra legroom due to the Exit Row, however, the proximity to the lavatory may be bothersome. There is no floor storage for this seat during takeoff and landing. The tray table and inflight entertainment monitor are in the armrest, making the armrest immovable and slightly reducing seat width. 30 B None No Power Seat 30 B is a standard Economy Class seat with additional legroom due to the Exit Row. There is no floor storage for this seat during takeoff and landing. The tray table and inflight entertainment monitor are in the armrest, making the armrest immovable and slightly reducing seat width. 30 C None No Power Seat 30 C is a standard Economy Class seat with additional legroom due to the Exit Row. There is no floor storage for this seat during takeoff and landing. The tray table and inflight entertainment monitor are in the armrest, making the armrest immovable and slightly reducing seat width. 30 D None No Power Seat 30 D is a standard Economy Class seat, however, the proximity to the lavatories may be bothersome. Passengers requiring a bassinet are often sat here. There is no floor storage for this seat during takeoff and landing. The tray table and inflight entertainment monitor are in the armrest, making the armrest immovable and slightly reducing seat width. 30 E None No Power Seat 30 E is a standard Economy Class seat, however, the proximity to the lavatories may be bothersome. Passengers requiring a bassinet are often sat here. There is no floor storage for this seat during takeoff and landing. The tray table and inflight entertainment monitor are in the armrest, making the armrest immovable and slightly reducing seat width. 30 G None No Power Seat 30 G is a standard Economy Class seat, however, the proximity to the lavatories may be bothersome. Passengers requiring a bassinet are often sat here. There is no floor storage for this seat during takeoff and landing. The tray table and inflight entertainment monitor are in the armrest, making the armrest immovable and slightly reducing seat width. 30 H None No Power Seat 30 H is a standard Economy Class seat with additional legroom due to the Exit Row. There is no floor storage for this seat during takeoff and landing. The tray table and inflight entertainment monitor are in the armrest, making the armrest immovable and slightly reducing seat width. 30 J None No Power Seat 30 J is a standard Economy Class seat with additional legroom due to the Exit Row. There is no floor storage for this seat during takeoff and landing. The tray table and inflight entertainment monitor are in the armrest, making the armrest immovable and slightly reducing seat width. 30 K None No Power Seat 30 K is a standard Economy Class seat with extra legroom due to the Exit Row, however, the proximity to the lavatory may be bothersome. There is no floor storage for this seat during takeoff and landing. The tray table and inflight entertainment monitor are in the armrest, making the armrest immovable and slightly reducing seat width. 43 A None No Power Seat 43 A is a standard Economy Class seat in the last row of the aircraft. This seat has limited recline and the proximity to the lavatory and galleys may be bothersome. 43 B None No Power Seat 43 B is a standard Economy Class seat in the last row of the aircraft. This seat has limited recline and the proximity to the lavatory and galleys may be bothersome. 43 C None No Power Seat 43 C is a standard Economy Class seat in the last row of the aircraft. This seat has limited recline and the proximity to the lavatory and galleys may be bothersome. 43 D None No Power Seat 43 D is a standard Economy Class seat, however, the proximity to the lavatory and galleys may be bothersome. 43 G None No Power Seat 43 G is a standard Economy Class seat, however, the proximity to the lavatory and galleys may be bothersome. 43 H None No Power Seat 43 H is a standard Economy Class seat in the last row of the aircraft. This seat has limited recline and the proximity to the lavatory and galleys may be bothersome. 43 J None No Power Seat 43 J is a standard Economy Class seat in the last row of the aircraft. This seat has limited recline and the proximity to the lavatory and galleys may be bothersome. 43 K None No Power Seat 43 K is a standard Economy Class seat in the last row of the aircraft. This seat has limited recline and the proximity to the lavatory and galleys may be bothersome. 44 D None No Power Seat 44 D is a standard Economy Class seat in the last row of the aircraft. This seat has limited recline and the proximity to the lavatory and galleys may be bothersome. 44 E None No Power Seat 44 E is a standard Economy Class seat in the last row of the aircraft. This seat has limited recline and the proximity to the lavatory and galleys may be bothersome. 44 G None No Power Seat 44 G is a standard Economy Class seat in the last row of the aircraft. This seat has limited recline and the proximity to the lavatory and galleys may be bothersome. 5 K None No Power Seat 5 K is a standard Business Class seat that is missing one of two windows. 8 A None No Power Seat 8 A is a standard Business Class seat, however, the proximity to the lavatories and galleys may be bothersome. 8 D None No Power Seat 8 D is a standard Business Class seat, however, the proximity to the lavatories and galleys may be bothersome. 8 G None No Power Seat 8 G is a standard Business Class seat, however, the proximity to the lavatories and galleys may be bothersome. 8 K None No Power Seat 8 K is a standard Business Class seat, however, the proximity to the lavatories and galleys may be bothersome. All seats have a 16-inch HD touchscreen that features new films, movie classics and blockbusters, concerts, documentaries, music and games. All seats have access to a 110V power port and a USB power port. The Boeing 787-9 is equipped with Wi-Fi connectivity in all the cabins. When you are aboard, choose the Wi-Fi voucher option that suits your needs (20 MB, 50 MB, 200 MB) and get connected. Air France's newest aircraft, the Boeing 787-9 Dreamliner is outfitted with 276 seats. The interior features 30 lie flat Business Class seats, 21 Premium Economy seats, and 225 standard Economy seats. Air France flies 1 versions of Boeing 787-9.